Summary: He can’t leave his hotel. You won’t want to. 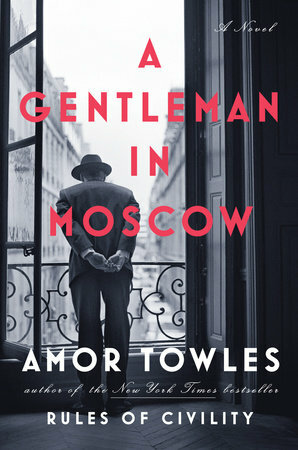 I was extremely excited to begin reading A GENTLEMAN IN MOSCOW by Amor Towles. I really enjoyed his last novel RULES OF CIVILITY, and I thought the description of this book sounded intriguing. Plus it was getting some stellar reviews. A GENTLEMAN IN MOSCOW tells the story of Count Alexander Rostov, a Russian aristocrat who had never worked a day in his life. In 1922, the Bolshevik tribunal sentenced him to live under house arrest in the Metropol, a ritzy hotel near the Kremlin. For many years, Rostov lived in a suite in this hotel, but he was now banned to a small attic room. Rostov was now forced to keep a daily routine for himself to keep his sanity and to make new friends with the hotel staff. He makes a very special friend in a young girl named Nina, the daughter of a bureaucrat; and Rostov realizes that his life can be meaningful despite being confined to a hotel for the rest of his life. Nina eventually grows up and moves away from the hotel; however, she comes back years later asking Rostov for a favor. This favor requires Rostov to once again turn his life upside down and shows just how much Rostov has grown as a man... and just how much he's willing to sacrifice for those he loves. I ended up loving A GENTLEMAN IN MOSCOW! However, that wasn't always the case. I had some issues getting into the story, and I'm not entirely sure why. It could have been what was going on in my life for those few days. Having said that, once I hit my stride, I couldn't put this novel down. I thought is was smart, charming, and touching... and it definitely exceeded my expectations. One thing I loved about the novel was the character of Rostov. At first he was a bit pretentious (and maybe that's why it took me a bit to really get into the novel), but he grew so much as he learned to accept and appreciate the world around him. He became a kinder, gentler man who made some terrific friends with the hotel staff; and more importantly, he learned what was really important in life and how to live his life with a purpose. I also loved so many of the supporting characters -- from the various people who worked for the hotel, to Nina, to Nina's daughter. Each one of these characters that Rostov encountered throughout his decades of house arrest helped to make him a better man. I loved the humor in their interactions as well as the warmth in their relationships; and through their stories, so much insight into human nature was offered. An interesting aspect of this novel was that it almost entirely took place in one setting -- the Metropol Hotel. I would actually argue that the hotel became another character in the story! Another interesting thing about the book was that there wasn't even much discussion of the political environment in Russia that was taking place right across the street. Rather, the novel focused on Rostov and his relationships... and how he changed as a result of them. A GENTLEMAN IN MOSCOW would make a wonderful book club pick, although it might be a bit long for some groups. I wasn't able to find a discussion on the publisher's website, but I did find this one with seven questions. Some of the themes you might want to discuss are the political environment in Russia through the years, friendship, family, imprisonment, love, art, and sacrifice. Overall, I thoroughly enjoyed A GENTLEMAN IN MOSCOW and highly recommend it to fans of literary fiction. This sounds fascinating - I can't imagine being confined to a hotel like that. I wonder if that really happened to people.